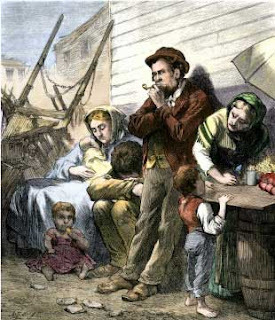 The appearance in Middleborough of the Famine Irish, those Irish Catholics who immigrated to America as a consequence of the Great Famine and its long-lasting effects, represented the first, though not the last, time that the town's Yankee heritage would be confronted by a largely alien culture. Certainly "more foreign" cultures would arrive later: Germans, Italians, Swedes, Finns, Portuguese, Poles, Lithuanians, Armenians and Chinese to name several. However, the arrival of the Famine Irish beginning in the late 1840s is significant for it represented Middleborough's first large scale exposure to a culture outside the familiar Anglo-American mold and as such it marks the beginnings of Middleborough as an immigrant community. Yet the Irish in 1848 were not newcomers to Middleborough, but rather had been associated with the town almost since its earliest years. The first Irish immigrants to Middleborough were the Protestant Scotch-Irish who arrived in force from the north of Ireland about 1720, settling in what was then Middleborough's west parish and is now Lakeville. Because of their Presbyterianism, they were not regarded as drastically different and they were readily assimilated into the local community. 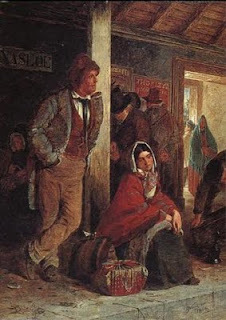 Following this small wave of Scotch-Irish immigration to Middleborough in the 18th century, Irish immigration to town remained negligible until the late 1840s when two successive seasons of failure of the potato crop (on which a large proportion of the Irish population depended) unleashed unprecedented suffering upon the Irish poor, forcing them to leave their homeland in inconceivable numbers. In time, many of these emigrants would find their way to Middleborough and Lakeville where they were confronted with a hard struggle to achieve acceptance. Social habits and cultural traditions set the Famine Irish apart from the Middleborough Yankee, but it would be their unwavering devotion to Roman Catholicism which would brand the Famine Irish as aliens in an otherwise relatively homogeneous, Protestant yet xenophobic Yankee world. The earliest Irish Famine immigrants were associated with the Catholic church, and when the early church was formed locally, it was composed nearly exclusively of Irish immigrants. The identities of "Irish" and "Catholic" became so synonymous in Middleborough and Lakeville that when the first generation of Irish Famine immigrants began to pass, their obituaries in the Middleboro Gazette frequently made note of them as among "the oldest Catholic residents" in town, considering their ethnicity and religion to be one and the same. Interestingly, neither Thomas Weston nor Mertie Romaine in their histories of Middleborough (1906, 1969) give much serious attention to local Irish Catholics (or other immigrant groups for that matter), an indication of the lingering perception that these groups were outside the pale of Yankee interest. Local anti-Catholic prejudice during the mid-19th century was fueled by the arrival of these Catholic Irish immigrants, and instances of anti-Catholic and anti-Irish sentiment have been documented locally. In its issue of July 1, 1853, the Namasket Gazette clearly revealed an anti-Catholic bias, mocking what it saw as the failure of Roman Catholicism in the educational field. In the island of Sardinia, Popery has everything its own way. And to the question, how does it educate its sons and daughters, a recent official report answers; it has 547,112 inhabitants; and of these, 512,381 can neither read nor write: yet the island swarms with priests, and for ages has been completely under their control. Undoubtedly, many of the newspaper's readers held similar, anti-Catholic biases. Further, the appeal to many Middleborough and Lakeville voters of the American (or Know-Nothing) Party which sought to restrict Irish immigrant rights in the early 1850s was further testament to the anti-Irish prejudice which was evident locally. Unquestionably, such views were based, in part, on ignorance and the fact that local residents knew virtually nothing about either the Irish or their religion. The inability of census takers during the mid-19th century to properly spell what were often the simplest of Irish surnames indicates the Yankee lack of familiarity with anything Irish and gives us a hint of how different the Famine Irish originally must have appeared to Middleborough residents. What are today common Irish surnames such as Shea, Roche, Kelliher, Sweeney, McLaughlin, Ryan, Keefe, Fitz, Nolan, Casey, Sheehan, Foley, Doherty, Callahan, Coughlan, McGuire, Maher, Connelly and McKenna were recorded in Federal census records for Middleborough as Shaw, Roach, Calirher, Swena, McLauthleon, Rine, Kiefe, Fitts, Knoland, Casy, Shean, Folia, Dorrity, Callehon, Cothlin, McGure, Mar, Conly, and McCanna. (Ironically though 19th century takers remained untroubled with Houlihan). The inability to spell such names is less a reflection of the census takers' abilities, and more an indication of the alien character of these surnames and the foreign nature of the men and women who bore them. 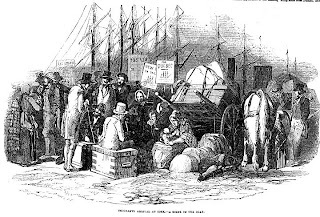 The period between 1850 and 1880 marks a period of heavy immigration and economic adjustment in the new world for the Famine Irish, and a period when the Yankee community would, at times, feel overwhelmed by the influx. Both Federal and state census schedules for the years of this period are indispensible for providing a basic outline of this immigration and adjustment period and they furnish much of the ensuing statistical information. ugh in the last years of the 1840s. Famine-rooted emigration from Ireland was not significant until 1847 after the potato crop failed for a second successive season. After that date, however, emigration became so heavy that firms engaging in the passenger trade were often unable to cope with the sheer volume of passengers. Firms like J. & J. Cooke which operated out of Derry were forced to charter private ships with which to supplement their own fleets. While the generally held conception is that all Irish immigrants who came to America and Middleborugh during the years immediately following the famine were poor peasants who sailed directly for America aboard the infamous "coffin ships", this scenario is only partially true. Not all Famine Irish who came to Middleborough were forced to do so through economic hardship. In fact, because they could not afford the passage money to America, the poorest of the poor frequently found themselves left behind in Ireland to cope as best they could, or they travelled to England at best. The fact that some of Middleborough's earliest Famine Irish immigrants such as Patrick Quirk and Richard Tobin were able to purchase lands shortly following their arrival is indicative of the fact that many came with at least a sum of money, albeit very modest. Additionally, not all Famine Irish came directly to America. Many went to England, initially, and the number of English-born children of Irish Famine immigrants in Middleborough attests to the fact that England became a stopping point on their journey to America. For some others, England became the end of the journey, either intentionally or because their was no more money to convey them any further. Michael F. O'Toole, one of Middleborough's earliest Famine immigrants was born in Dublin on September 29, 1831, and his journey to America was typical of that of other immigrants. He initially sailed for St. John's, New Brunswick, before relocating to Providence and ultimately Middleborough where he arrived about 1847. There is no record regarding when the first Famine Irish began arriving in Middleborough, though Thomas Weston states that the first Irishman in Middleborough was "Dennis Shaw" who settled at Muttock. Presumably, Weston is speaking of the first Irish Catholic for as been indicated, Scotch-Irish had been known in town for over a century. Weston's "Dennis Shaw" is no doubt Dennis Shea, and the discrepancy is attributable to Weston's poor orthography. Though no date of arrival is indicated for Shea, it was certainly sometime prior to October, 1849 when another Irish Famine immigrant, Philip McGuire, lost an infant child. Of McGuire it was noted at the time: "Emigrant from No. Ireland, ...Catholic 1 or 2 children". As noted previously, Michael O'Toole, Patrick Quirk and Richard Tobin were also among the community's first Famine Irish immigrants. The Irish-born population of Middleborough was numerically never very large and peaked around 1855 at roughly 4.2 per cent of the population. In comparison, Boston at the same time is estimated (depending upon one's source) to have had an Irish-born population of from 20 to 25 per cent. In contrast, the figure for Middleborough was small indeed. Many of the Irish immigrants to Middleborough did not remain long. Some probably stayed only long enough to earn sufficient money to enable them to continue moving to a better job, to settled relatives or to a community more to their liking. Irish families did eventually establish roots in town, however, and the number of Irish-born householders rose from 13 in 1850 to 32 (1855), 41 (1860) and 52 (1865) where it seems to have levelled off and remained constant. These figures also indicate that continuing Irish immigration into Middleborough due to the lingering effects of the Famine as well as the consequences of the Land War in the 1870s and after was heavy enough to offset the loss of Irish-born householders who either moved out of town or died. A large proportion of the Middleborough Famine Irish, as elsewhere, was woefully uneducated or under-educated. Yet given the fact that historians have generally placed the literacy level of Ireland at the time of the Great Famine at about 50 per cent, the level of illiteracy among the first Irish immigrants should not be surprising. When figures concerning education were first recorded in the Massachusetts state census for 1865, 31 per cent of Middleborough's Irish-born population aged 20 years or older were either partially illiterate (could not write) or wholly illiterate (could neither read nor write). By 1880 this figure had fallen to 22 per cent as Irish immigrants availed themselves of the opportunity of free public education. A number of points may be made regarding both this decline and Irish literacy in general. Illiteracy naturally proved a bar to better employment. In the 1865 state census, those Irishmen with an occupation listed and who were recorded as being illiterate were without exception employed either as common or mill laborers. In 1880, illiteracy among Irish immigrant men was confined solely to the laboring class as well as a few farmers. Irish men tended to be better educated than Irish women (a distinction which was not confined to the Irish), and Irish women tended to be wholly rather than partially illiterate. Only in one married Irish household did the wife possess a better education than her husband. Significantly, the median age of the illiterate Irish increased between 1865 and 1880 indicating that younger and newly-born Irish Americans began to acquire the education which their parents lacked. In time, it was to be this educational opportunity which, in part, would allow the Irish Catholics of Middleborough to survive and to succeed. "Irish Emigrants Arrival at Cork. - A Scene on the Quay". Illustrated London News, May 10, 1851. United States of America, Bureau of the Census. Seventh Census of the United States, 1850. Washington, D.C.: National Archives and Records Administration, 1850. United States of America, Bureau of the Census. Eighth Census of the United States, 1860. Washington, D.C.: National Archives and Records Administration, 1860. United States of America, Bureau of the Census. Ninth Census of the United States, 1870. Washington, D.C.: National Archives and Records Administration, 1870. United States of America, Bureau of the Census. Tenth Census of the United States, 1880. Washington, D.C.: National Archives and Records Administration, 1880.